JB, I have 2 GA Tickets For Wednesday. I will be in Red Zone for the show. There actually playing it at all the Cinepolis locations in NJ/NY that night. I had two friends drop out of next Wednesday's show. They were in GA and I am in Red Zone. Still looking for 2 GA tickets? I had 2 friends drop out for next Wednesday's show. 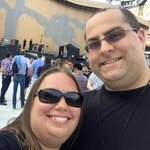 Help Me Correct Ticketmaster Screwup! 2 GA For 2 Red Zone Swap? Long story short, Ticketmaster royally screwed me on processing my order. They processed my 4 Red Zone tickets in the presale as 2 Red Zone & 2 GA. After being on the phone for hours the past week and them 100% admitting it was there fault I have gotten no where. I keep being told that Red Zone is sold out and there's nothing they can do. I have 2 long time college friends coming along with my wife and I, but now we will be in different sections. Not sure if possible, but would anyone know anyone that would possibly be interested in swapping my 2 GA tickets out for 2 Red Zone tickets this way my entire group is in Red Zone. I have begging and pleaded with Ticketmaster for hours and haven't had any luck and am feeling pretty desperate right now. Of course I would pay the difference as I just don't have any clue what to do. Any insight would be appreciated. Thank you! I have never had such a terrible experience buying tickets as I did with this presale. So long story short, after working on getting tickets for almost 45 mins after the presale started due to the browser crashes, time outs, etc I was able to get 4 Red Zone tickets for my wife and I plus my 2 college friends that are flying in to see the show with us. Had 4 locked in, processed the order and right when it was charging the card the "We are unable to process the request popped up" and i was back to square one. After a decent panic attack, I heard the email on my phone and it was from ticketmaster. It did process but only for 2 tickets? After 2, 45 minute phone calls, I got through to someone at ticketmaster who confirmed it was a mistake on there end and would correct the invoice. After a little more waiting he said everything was good to go and I would get an email with the new invoice showing the 4 tickets and my account would be updated accordingly. Received the email and he purchased 2 GA tickets for the show. After another 40 mins of waiting on hold and talking to several associates and 2 supervisors I was told all the Red Zone tickets for the show are sold out and there is no way for them to make the correction, even with them admitting it was there fault to start with and admitting the other agent messed up the correction as well. The last I spoke they were reaching out to the venue to see what they could do. I received this email about 2 hours later " Following up I am sorry to advise the inventory is sold out". Im super upset and would really like my whole group to be together. Any one have any ideas on what to do?